In little more than seven months TriMet riders have purchased more than a million tickets with the TriMet Tickets mobile app. TriMet Tickets allows riders to pay for and use single tickets, as well as day, weekly and monthly passes all from their mobile phone. It’s quick and easy, and no cash required. Since we rolled out the app in September 2013 for iPhone and Android smartphones, the number of downloads have rocketed to more than 80,000 shattering our first year goal by more than 50,000 downloads. TriMet partnered with local software developer GlobeSherpa to create the app at no upfront cost to TriMet. 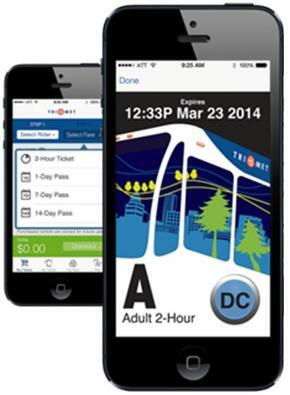 With its release, TriMet became the first transit agency in the U.S. to implement a mobile ticketing app for use on both buses and trains. Learn more about the TriMet Tickets app at trimet.org/mobiletickets. “The success of this program sets on a solid path to move to an electronic fare payment system in the coming years that continues to make it simpler to buy a fare,” said McFarlane. In March, the agency awarded a major contract that will bring electronic fare to the Portland metro area in 2017. TriMet selected Innovations in Transportation, Inc. (INIT) to develop the equipment needed for an e-fare system. The e-fare system, to be tested publicly in 2016 and slated for full system-wide launch in 2017, will allow riders to choose from a variety of easy payment options including a transit-only smart card, contactless bank card and a smartphone with Near Field Communications. Based on the popularity of the mobile tickets, we expect riders will also welcome the e-fare with the same enthusiasm. For more in e-fare visit news.trimet.org.